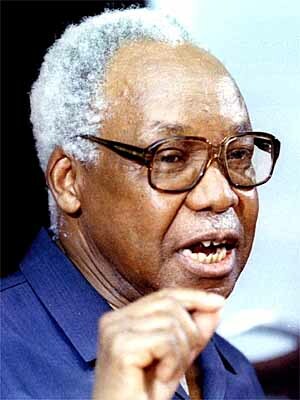 Julius Kambarage Nyerere, the first Prime Minister of independent Tanganyika and one of the founders of Tanzania, was born April 13, 1922 in Butiama, Tanganyika. The son of Zanaki chief, Nyerere Burito, he began his education at age 12. Nyerere eventually gained a certificate from Makerere University College in Uganda as a qualified teacher. In 1949, he moved to Scotland and in 1952 he became the first Tanganyikan to earn a university degree when he graduated with an M.A. from Edinburgh University. In 1953, he returned to Tanganyika and married Maria Magige, with whom he fathered seven children. Nyerere’s political career began on July 7, 1954 when he became president of the Tanganyika African National Union (TANU). The TANU was a nationalist party that called for an end to British rule in Tanganyika. The party grew rapidly and by 1960 Nyerere was elected as Chief Minister of Tanganyika. On December 9, 1961, as the result of lengthy discussions between Nyerere and the British Government, Tanganyika was granted its independence and Nyerere became its first Prime Minister. Three years later, on April 26, 1964, Nyerere negotiated a union with newly independent Zanzibar and became president of the newly formed country of Tanzania. Nyerere remained president until November 5, 1985. He continued to lead TANU until 1990. During his presidency Nyerere enforced a doctrine of African socialism, which ascribed to the idea that before colonization, African society was essentially egalitarian and free from the extremities of poverty and wealth. Nyerere wished to return to this pre-colonial state and build a society based on self-reliance. Thus he reinstituted Kiswahili as the national language and proposed the Arusha Declaration in 1967, which outlined his vision of a socialist Tanzania. Nyerere was also active in aiding other African nations in resisting white minority rule through such acts as boycotting South African goods. Nyerere was also one of the founding members of the Organization of African Unity (OAU) in 1963. Nyerere was often accused of being authoritarian in his insistence on a one-party rule in Tanzania, and his policy of ‘villagisation’ was met with criticism. However, his adopted name, ‘Baba wa Taifa’, meaning ’Father of the Nation,’ shows the respect Tanzanians had for him and the role he played both in gaining Tanganyikan independence and in creating the Tanzanian nation. Julius Nyerere died in a London hospital on October 14, 1999. Hakim Adi and Marika Sherwood, Pan-African History: Political Figures from Africa and the Diaspora Since 1787, (Routledge: New York & London, 2003); Anthony Bogues, Black Prophets: Radical Political Intellectuals, (Routledge; New York & London, 2003); Ed. Kevin Shillington, Encyclopaedia of African History, Vol.2 (Fritzroy Dearborn, 2005).